If you want none of the disposable earplugs like Max Earplugs or Max Lite Earplugs, you can opt for EAR Express Pod Plugs. Available in assorted bright colors, EAR Express pod plugs are reusable and hygienic, perfect for frequent use of pod plugs in noisy workplaces. The earpods are especially useful due to the patented InstaSeal TM system feature that combines a unique pod shape and a soft grip. The shape of the soft foam is designed as such that it has a slow recovery time and user can get secure fit every time. Thanks to the shape also, the pod won’t be easily shifted or dislodged as the result of jaw movement. The soft flexible grips make them easy to insert and remove. The EAR Express pod plugs comply with ANSI S3.19-1974/CSA Z94.2 regulation while reducing noise up to 25 dB. Each pair is nicely and safely packaged in reusable pillow pack. 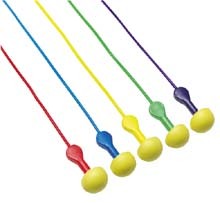 Order these corded assorted color pod plugs now.